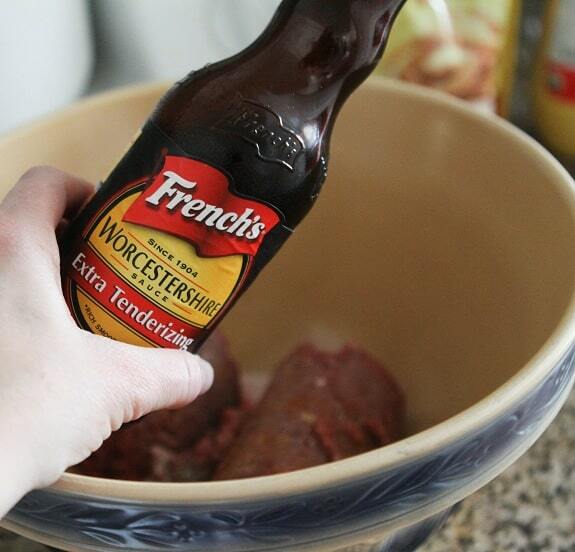 Bringing more delicious dinner ideas your way! Anyone else think they could eat these meatballs everyday next week and be completely happy?! Heaven knows my family could and practically did last week, lol! 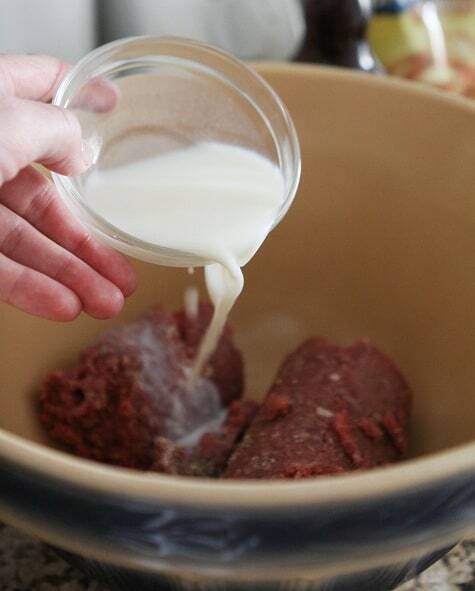 My boys devoured these gorgeous beef balls and are very sad they are gone now. Hope you enjoy! On another note, did anyone see Adjustment Bureau over the weekend?! We loved it! I couldn’t be more thrilled that my sister and her family are visiting from AZ! We are off to Disney today, let’s hope the weather cooperates with us! Little Mozzarella balls straight from heaven, love these blasted things. 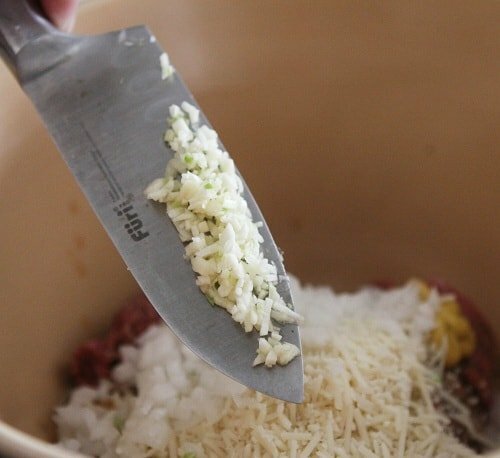 …and the garlic. 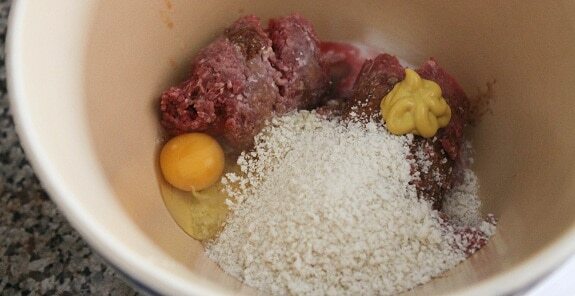 Give it all a big mix until just combined. 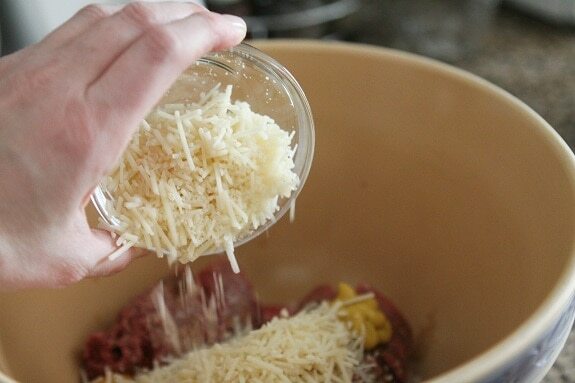 Make sure the cheese is fully enclosed and it’s time to bake. These are so good, hope you enjoy! These look delicious! 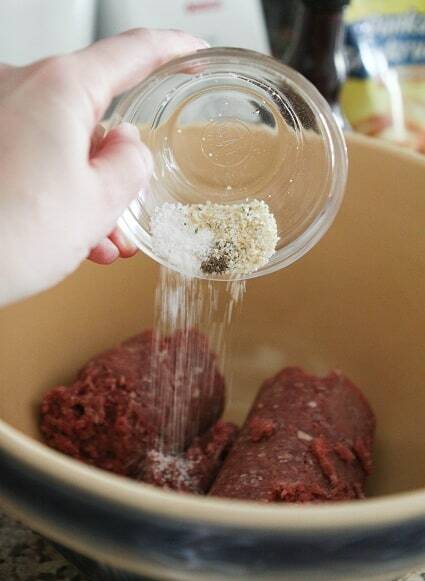 I’ve stuffed burgers but never meatballs. Looks like I’ll have to try this soon! Jenny my hubs would adore these! I don’t eat meat or cheese or bread…lol…so these are not on my radar screen but what is…is your amazing photography! Oooh my man will absolutely love these! 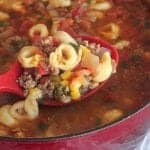 This is one of my fiance’s favorite recipes. I haven’t made them in ages, and I know he would be pleasantly surprised if these showed up on his plate some night this week. Thanks for the reminder! 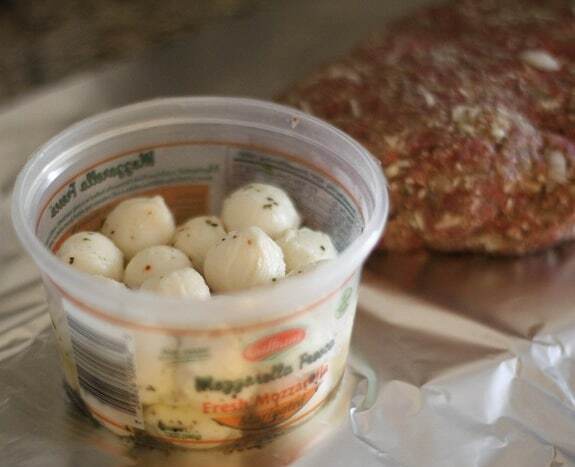 i’ve always thought to stuff mozzarella into meatballs but never actually saw it done…it sounds AH-mazing! Wowzer, that’s heaven alright. 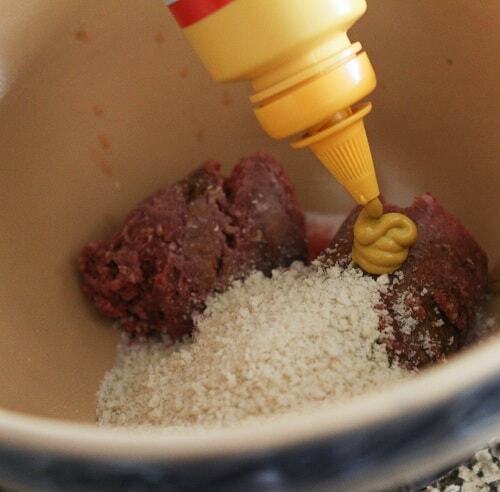 I’m going to put some Mootz in my meatball recipe next time I make the !!! yum! 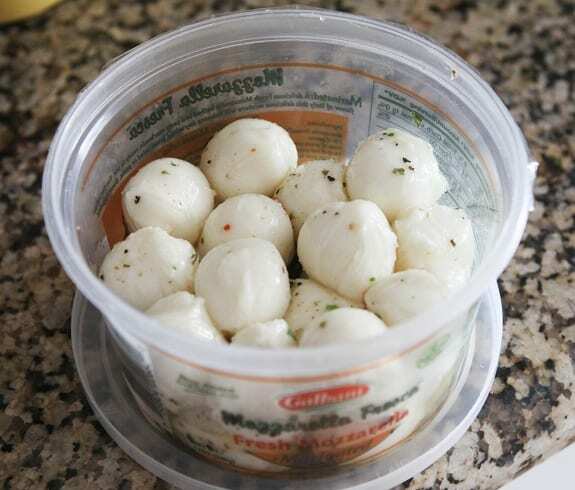 I love the little mozzarella balls. I will definitely be making these. Enjoy Disney today! What a great concept since you can not go wrong with CHEESE! I will be trying these but just changing them to accomadate my Gluten Free Life! My hubby and boys are crazy for meatballs. They will LOVE these!! I love the cheesy inside! Oh my goodness, these look delish!!!! Wonder how they would be if made with turkey? We recently gave up red meat in an EFFORT to be more healthy LOL….good luck right? We love good food and I love to cook and blog about it too (new blogger but hey..). Oh man, I must try these! YUMM! I love those little cheese balls too. Great in a caprese salad with tomatoes, some basil etc. YUMM! 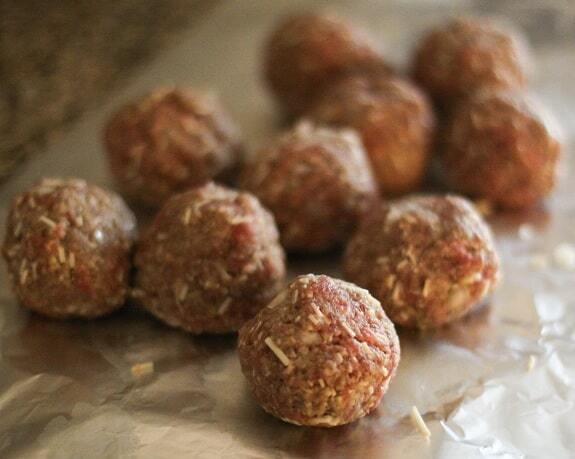 I’m a huge meatball fan, but I’ve never tried them stuffed with cheese. Now I can’t imagine why I never would have thought of something so obviously meant to be! You’re a genius! Thanks!! These remind me of deep-fried risotto balls, stuffed with fresh mozzarella. 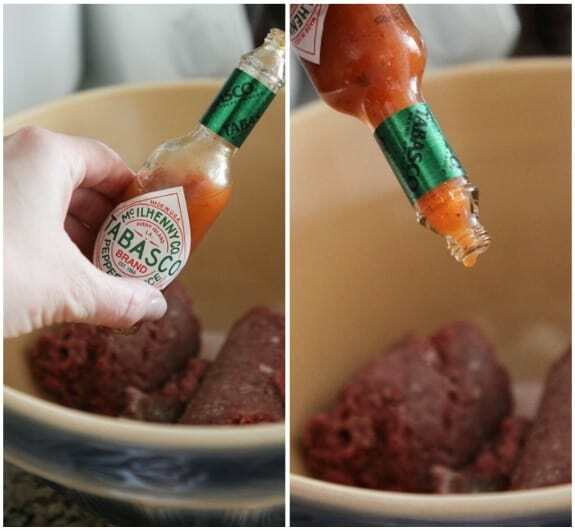 What a fun way to shake up meatballs a little. Have a great time at Disneyland! Delicious little bites! Perfect idea to tuck the cheese inside there all melty and everything. Yum! 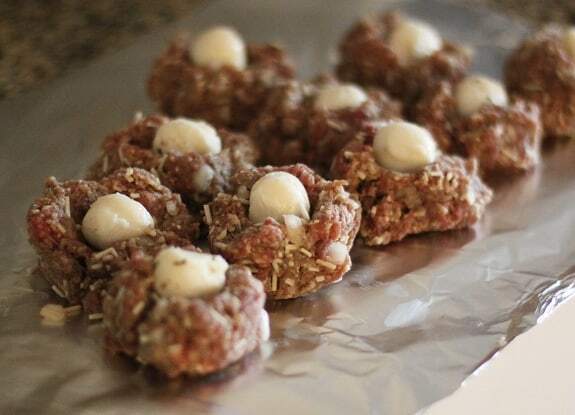 Stuffed cookies…stuffed meatballs. I’m down. 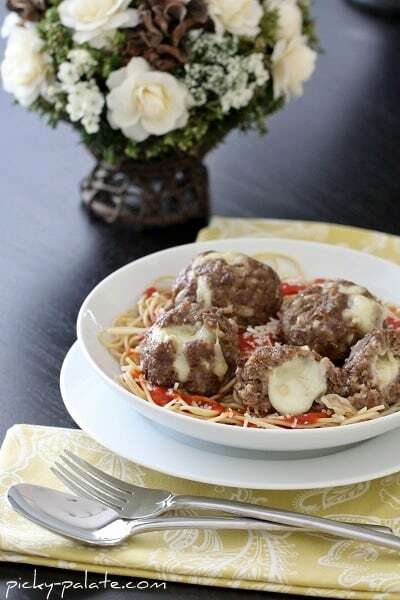 Meatballs, cheese, pasta…pretty sure all bases are covered!! Is it too early for a plate of this right now? I’m hoping our next date night involves seeing The Adjustment Bureau. It looks like a great movie. You’ll love the movie, have fun!! I was just thinking to myself that I have some ground beef I need to use up this week. This is perfect! Thank you! Also, I LOVE your napkins! Did you watch Iron Chef America last night? 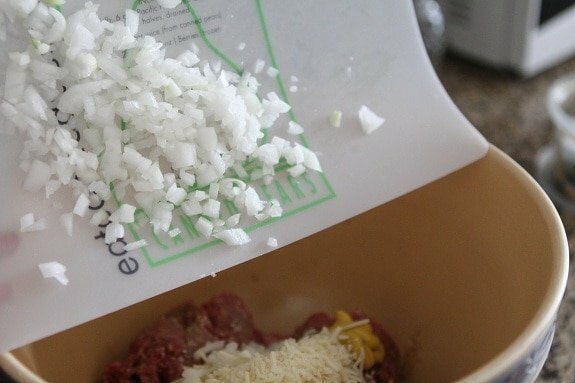 Mozzarella was the secret ingredient and someone made mozz stuffed meatballs. Yum-o – thanks for posting! I didn’t see the Iron Chef, bet it was a great episode!! What a fun dinner idea! These look delicious, Jenny. I’m sure your family enjoyed them so much, and I know my husband and I will, too! Thanks for sharing. 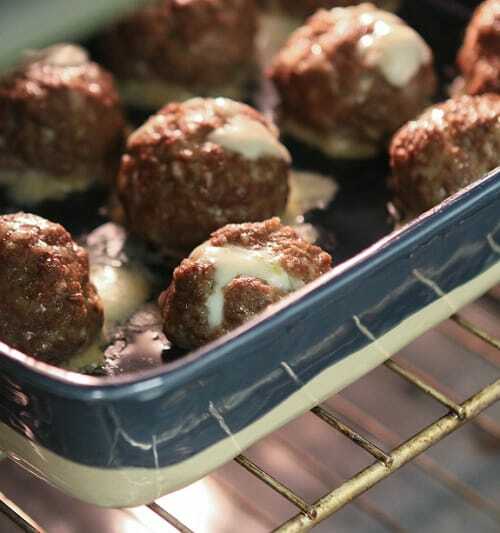 Instead of stuffed cookies – cheesy stuffed meatballs. Love this Jenny! 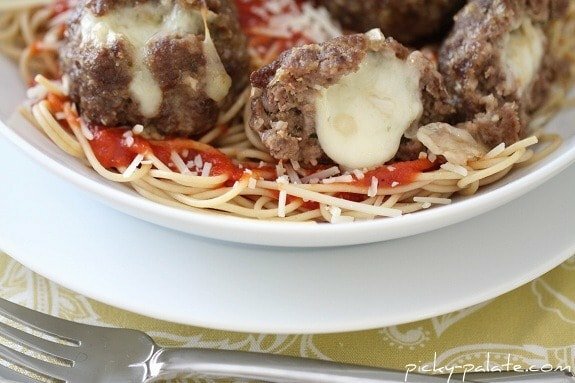 My whole family would be all over that beautiful bowl of spaghetti and meatballs. Gotta get some mozzarella pronto! looks beautiful and tasty! great instructions. I LOVE LOVE LOVE LOVE this! truly, what a fabulous meal. Love, love, love this!! 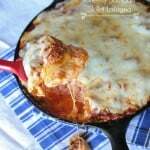 I will be making these for dinner one night this week!! Gorgeous! Bet these are delicious! Looks like a very yummy dinner!!! Honestly, I can’t even handle these. I’m in love. 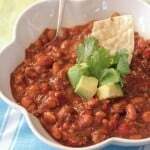 I have a recipe very similar to these. They are SO good! What a great idea, love that cheese oozing out from the center! YUM! Oh wow! 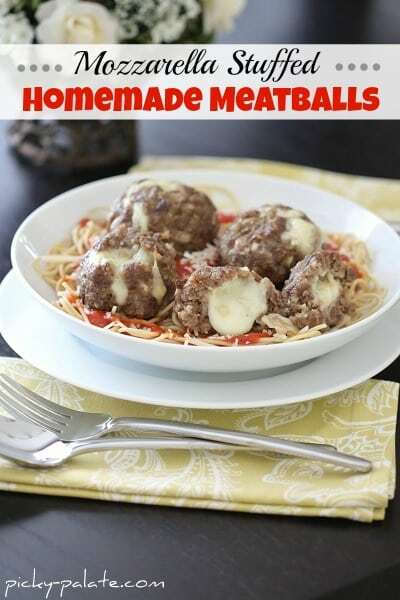 I’m not even a big meatball fan, but these look amazing. 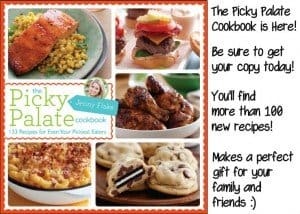 And my husband would be so happy if I made these, so I am definitely bookmarking this page! Wow, I am so glad my husband doesn’t read food blogs (besides mine of course)…because he would seriously be dying for these right now…and then I, Mrs. Pregnant-with-no-will-power would end up eating them all. We’ll have to make these for an upcoming party–yum!! I just saw this post and screamed to my husband in the other room about how excited I am to try these. What a great idea! Thank you for sharing! It’s always a pleasure to hear from someone with expresite. 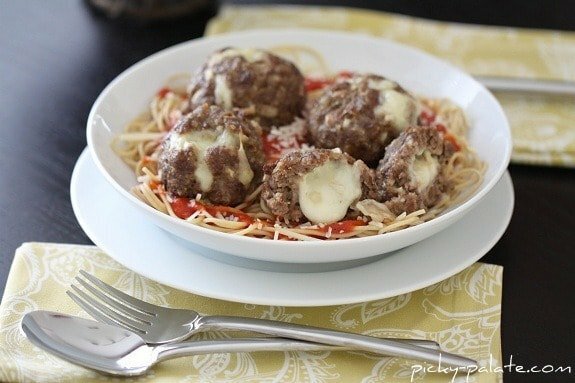 I love those mozzarella balls, and putting them inside meatballs is just genius! What a great idea, yum! These look great! Saw a Chef last night on Iron Chef America make a version of these(mozzarella was the secret ingredient). Looking forward to trying these balls. This looks SO good to me that I literally was telling my husband about this as we enjoyed a delicious bowl of Jambalaya with Andouille Sausage with Shrimp that I made for Fat Tuesday…made it a day early so I could blog it LOL. 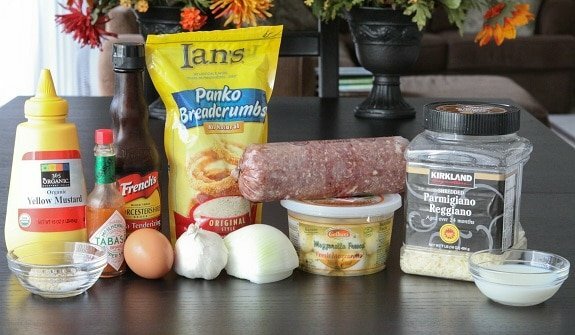 Anyway, when we get off this healthy kick (made a lighter jambalaya but omg so good)…I am MAKING THESE! You are queen of stuffed! 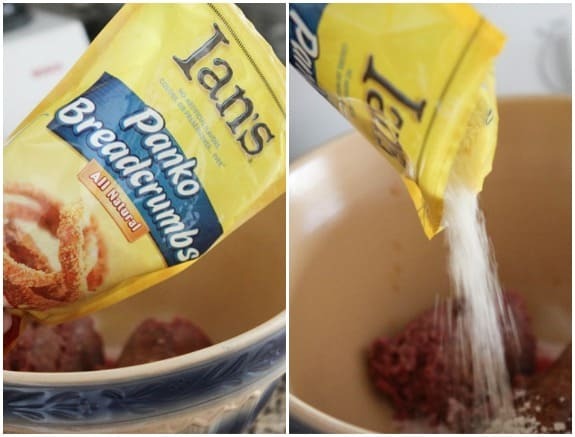 Another recipe to put on the list to try after my next shopping trip. Thank you for sharing and for the inspiration! I made these last night for supper, but didn’t have mozzarella balls, so I cut up some pieces of string cheese (I know, right?) and used that…along with a few other modifications to make them to my family’s taste. They were AWESOME! Thanks for the great recipe! stuffing meatballs sounds like a great idea to me. I love this idea! Cheese makes anything better – especially if it’s hidden inside ;).